Saturday the local HMGS-South group played a game of Hail, Agrippa!. The Hail, Agrippa! rules are a modification of Hail Caesar published in Issue 66 of ‘Wargames, Soldiers and Strategy’ magazine. The scenario was based on the battle of Actium in 31 BC. The fleet of Marcus Antonius attempts to defeat, or failing that break through, the fleet of Octavius. The fleet of Antonius advances with the heaviest units on the left. Agrippa has placed his heavy ships on his right and deploys the lighter and faster units on his left. Antonius’ heavy ships make some progress on the left, but the out-numbered right wing is being outflanked. The loss of units was surprisingly even throughout the game. Octavius is killed when his unit is destroyed. Alternating close combat victories leave the forces in the center mixed. Each side’s right flank is all but destroyed. Antonius and Cleopatra have a possible escape route. Each side lost seven units and the fleet of Octavius was left with more un-shaken units. There was an opening for Antonius and Cleopatra to make their historic escape, but with Octavius dead, Antonius might have gone back to his army and attempted to continue the campaign or negotiate with whoever emerged as the leader of his opposition. The scenario was a hypothetical battle set during the siege of Rhodes by Demetrius son of Antigonus. Ptolemy has sent a fleet to lift the siege. It is met by the Antigonid fleet in the narrows between Evlimnia (Alimia) island and the mainland of Rhodes. View from the island of Rhodes toward Makry (Makri) island with Evlimnia (Alimia) and Chalki in the distance. Good command rolls allow the Antigonid divisions to race forward to support their isolated ships near Evlimnia. One Antigonid division continues to advance while another balks. Blunders in the Ptolemaic center delay the advance. Casualties accumulate for both sides in the center. The Ptolemaic division near Makry blunders several times and never gets into action. The flank attack by the Antigonid heavy ships from Evlimnia finally goes in, but does little damage initially. The flank attack becomes effective, but losses are still about even. We quit at this point due to the time. With the battle a draw, the siege of Rhodes can continue. The scenario was based on the Battle of Chios, 201 BCE. Philip V of Macedon has given up his siege of Chios and is attacked by an allied fleet primarily from Rhodes and Pergamum. The primary source is Polybius. The players were allowed a free setup, done secretly and without knowledge of the composition of the opposing fleet. There were five players. The Macedonian fleet had three divisions (one for each player) and the Rhodian fleet had four divisions (two for each player). The Macedonian fleet was larger, but of lower quality than the Rhodian fleet. (1) The command rolls used a D10 [1to3=1 move, 4to6=2 moves, 7to9=3 moves, 10=blunder]. (2) The unit values were specific to each fleet. The Rhodians were generally faster and had better morale values. (3) Break results did not eliminate full size units. Stands were replaced with half-size stands (two ship models) with combat and stamina values halved. The poor quality photos are the result of my forgetting my camera and having to use a cell phone. View from the east after turn one. The Rhodians advance rapidly to attack the Macedonian left and center. The light ships of the Macedonian left wing lose units, but occupy half of the Rhodian fleet for most of the game. The fight in the center results in units pushed back on both sides. A series of blunder command rolls prevents the Macedonian right wing from getting into battle. The Macedonian right wing commander rolled 5 blunders, mostly in the early turns. This effectively kept about a third of the fleet out of the battle. The Macedonian left is finally destroyed. The Rhodians redeploy to face the new threat from the west. View from the south at the end. The Macedonian right wing and the Rhodian reserve are still intact. After about 4 hours of play we had to quit. The battle was still close at the end, with about equal numbers of undamaged units. Decades ago I used Valiant Enterprises ‘Ramming Speed’ 1/900 scale pentakonters as 1/1200 scale aphract trieres. Since I could now use more cataphract trieres, the models are being converted by filling in the exposed benches with strips of paper. Only 40 to convert…. Saturday the local HMGS-South group played a fictional Punic War battle using Battlesystem. Carthaginian heavy cavalry drives off Roman skirmishers to hit the flank of Roman infantry. Medium cavalry charges the front. A Roman unit is destroyed and the heavy cavalry recoils. Roman cavalry exploits a hole in the Carthaginian lines to attack Carthaginian skirmish cavalry. An elephant counter charges into their flank. Phalanx and skirmish cavalry advance. Roman infantry drives off the skirmish cavalry with fire. Roman infantry hit a phalanx unit in flank and rear. With both sides bloodied and lines in disarray, we called a halt to the carnage. Saturday the local HMGS-South group played a game of Hail, Agrippa! at the Dogs of War shop. The Hail, Agrippa! rules are a modification of Hail Caesar published in Issue 66 of ‘Wargames, Soldiers and Strategy’ magazine. The scenario was based on the Battle of Salamis (Crete), 306 BCE fought between an Antigonid fleet led by Demetrius and a Ptolemaic fleet led by Ptolemy in person. The main source for the battle is Diodorus. 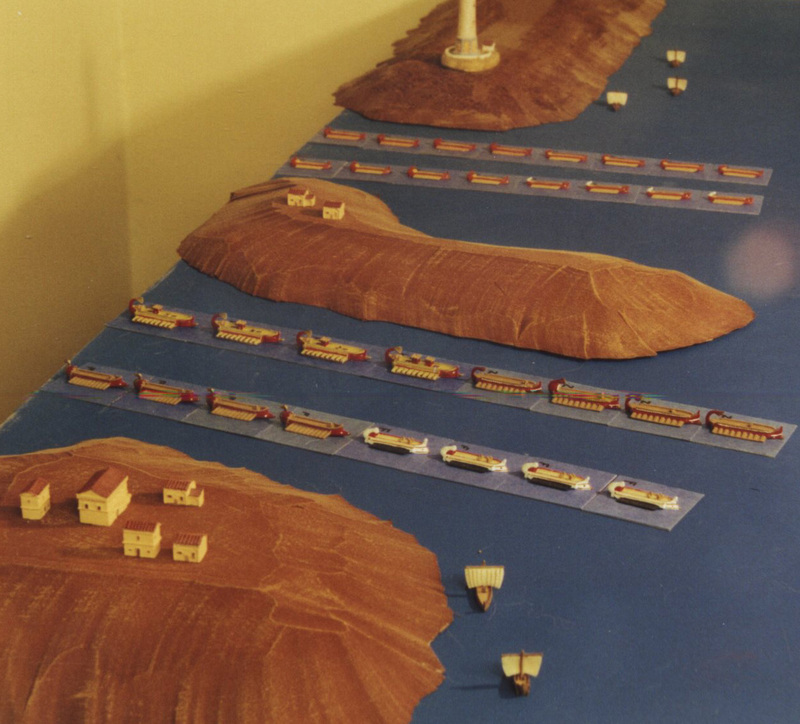 The units in the game (4 models on a base) represent about 10 ships each. Miniatures are primarily Langton 1:1200 and Navwar 1:1200, with a few Valiant 1:900 and scratch-built ships. As described in Diodorus, the Antigonid fleet deploys first, and the Ptolemaic fleet second. Ptolemy has chosen to deploy to seaward (east) of Demetrius. His lightest ships are on the right wing. Ptolemy advances rapidly while Demetrius pivots. The left wings and centers clash and both right wings are delayed by failed orders. Ptolemy loses a unit. Most of Ptolemy’s center is destroyed by bad rolls on break tests. Demetrius swings his right wing inward. The remaining Ptolemaic ships flee. This is a very speculative attempt to model a double-hulled ship carrying a siege tower in 1/1200 scale. Demetrius I Poliorcetes or Lysimachus may have used something like this for siege operations against cities in the early 3rd Century BCE. See Chapter 6 of “The Age of Titans” by Murray. The model uses the hulls of two 1/900 scale Ramming Speed ships by Valiant Enterprises. The tower is 30 meters tall in 1/1200 scale, or about 3/4 of the estimated height of Helepolis. The 1/1200 scale ancient ships were temporarily re-based for Hail, Agrippa! simply by sticking the old individual bases to cardboard. In order to use the same ships for various game systems, they are being fitted with rare earth magnets. Custom 40 mm x 130 mm magnetic hardboard bases were made by Good Ground LLC. The magnetic material on the bases is intended for transport using steel drawers. Here they are being used upside down so the rare earth magnets on the ships will stick. This allows for variations in the type, number and positions of ships. Tap wrench used as a large pin vice to drill holes for magnets. From the left: Right side up, upside down, painted. The scenario was loosely based on the Battle of Cos, 258 BCE (or 261, or whenever; nobody knows) fought between an Antigonid fleet and a Ptolemaic fleet. The order of battle was determined by the miniatures available, and included ships as large as deceres (or dekeres) which are probably heavier than any at the real battle. Fleets of this period might be 100-200 ships, so the units (4 models on a base) might represent 9-18 ships. Miniatures are primarily Langton 1:1200 and Navwar 1:1200, with a few Valiant 1:900 and scratch-built ships. The six players each had a division of 3 or 4 units. The southern shore of Cos Island is in the background. The seaward division of the Antigonid (blue) fleet consisted of trieres only. One unit engages Ptolemaic penteres while the division tries for an outflanking move. One unit of trieres is destroyed, but the others use their speed (and very good command rolls) to escape. The center Antigonid division has lost two units to lighter opponents. We did not use the ‘broken division’ Hail Caesar rules, so the remaining unit fights on. The victorious Ptolemaic units blunder and continue to the right. Bad command rolls make it difficult for the Ptolemaic division in the foreground to reform and give chase. In the distance, the Antigonid division backs water to avoid heavier opponents. The seaward Ptolemaic division has left 2 units behind in order to get back in the battle. Antigonid trieres race to the opposite end of the line to threaten the rear of the heavy Ptolemaic units. The landward divisions engage. The Ptolemaic ships are heavier, but the Gods favor the Antigonid ships. With the Antigonid fleet having lost 4 of 10 units and the Ptolemaic fleet 2 of 11, we called the game at this point.